It was a week of firsts and lasts in my garden. The first artichoke makes dinner a celebration. This one was extraordinarily tender and succulent. The artichoke plants are very robust this year, likely due to the frequent winter rains. Hoping for many more artichokes like these. My favorite is yet to come—the Italian artichoke Violetta Di Chioggia. The broccoli run is finished so I began removing the dozen plants last week. Thankfully, no aphids this year though they’ve been on my red cabbage, lettuce and roses. I salvaged some of the tender young broccoli leaves growing near the base of the plant. Most of my plants look like this. A few of them had a singular offshoot that appeared to be a new plant. I’ve read about the perennial nature of broccoli in temperate climates. I’d love to experiment but my garden is too small. A handful of the slightly larger leaves went to a friend who used them in a soup. Some of the larger leaves and stems went to a friend with rabbits. A few last broccoli side shoots. We’ve been eating broccoli since early January. The lettuce will finish in the next week or two depending on the weather. If it’s cool it will be less likely to bolt. In the meantime I’m doling lettuce out to all takers. And there are luscious salads everyday. Some kumquats remain on the tree but I hope to make marmalade this week. Calendula petals and kumquats brighten any salad. 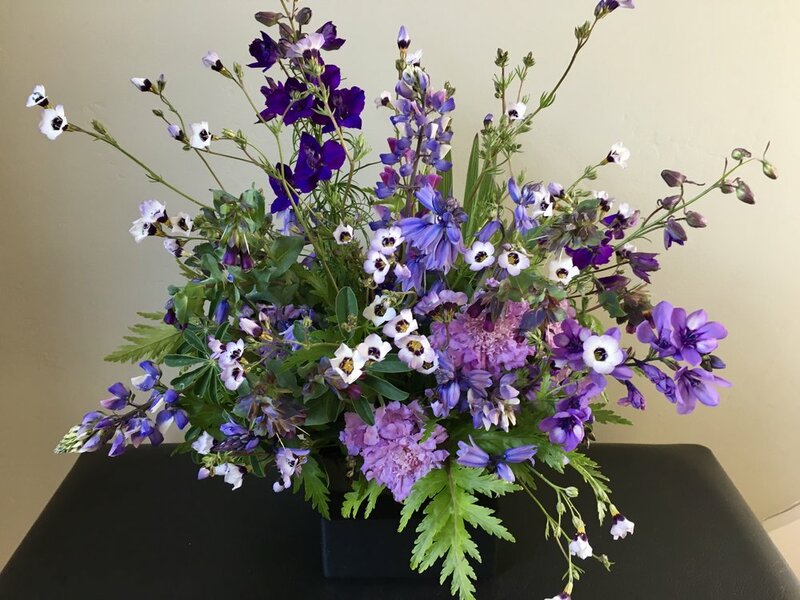 Purple is the dominant color in the perennial garden at this time, featuring native lupine, Spanish bluebells, cerinthe, larkspur, perennial scabiosa, babiana and gilia tricolor. It is truly spring.